Several powerful enchantments applied to rings. All rings are craftable at the Blacksmith Forge (from the Jewelry section) for the simple cost of YOUR SOUL (or someones soul anyway) neatly packaged in a Black Soul Gem. Ring of Talos - Reduces the Shout cooldown to zero. It will say its only reduced by 20% but it's really 100%. Ring of Archmage - Has all the enchantments of the Archmage's Robes. Ring of Konahrik - Has the enchantment of the Konahrik Mask. Ring of Mage Armor - The Ebonyflesh Alteration spell (100 points of armor), this ring is effected by the Mage Armor perk. Ring of Revival - Buffs health, stamina and magicka regen by 1000%. Ring of the Tenth Eye - A night vision enchantment with a little extra, "See what others cannot." Ring of Shadow Warrior - The Shadow Warrior perk as an enchantment, sadly this suffers from the same problem as every other form of invisibility in that it breaks as soon as you activate something. Simply un-equip and then re-equip the ring to regain the effect. Ring of Dragonhide - The Dragonhide Alteration spell (80% physical damage reduction to the wearer) now an enchantment. Ring of Dragonskin - The Dragonskin Breton power (Absorb 50% of the magicka from hostile spells) now an enchantment. Ring of Crafting - Makes Alchemy, Smithing and Enchanting 100% stronger. Ring of Avoid Death - The Avoid Death perk (Once a day, heals 250 points automatically if you fall below 10% health) as an enchantment. Ring of the Merchant - The Merchant perk (Can sell any type of item to any kind of merchant) as an enchantment. Ring of the Fence - The Fence perk (Can barter stolen goods with any merchant) as an enchantment. Unlike the perk you don't need to invest in the merchant to sell them the stolen goods. Ring of Warding - Casts a semi-permanent Greater Ward for as long as you wear the ring. Ring of Arcane Mastery - All spells take 100% less to cast. Ring of Imperial Luck - Now you don't have to be a Imperial to have their luck. Ring of Elder Wisdom - Force Without Effort, Eternal Spirit and Fire Within effects in one ring. Ring of Aquamancy - Enables you to walk on water as well as breath water. Ring of Ethereal Form - The Become Ethereal shout as an enchantment. Ring of Eloquence - Barter and Speech boosted by 100. Ring of Reflect Blows - The Reflect Blows perk (10% chance to reflect melee damage back to the enemy while wearing all Heavy Armor: head, chest, hands, feet) as an enchantment. Ring of Reflect Every Blow - The Ring of Reflect Blows enchantment modified to work 100% of the time and without armor restrictions. Ring of Beserker Rage - The Orc's Berserker Rage power as an enchantment. Ring of Quick Shot - The Quick Shot perk (Can draw a bow 30% faster) as an enchantment. Ring of Slow Time - The Slow Time shout as an enchantment. Ring of Magic Immunity - 100% resistance to Magic, Fire, Frost and Shock. Ring of Storm Call - The Storm Call shout as an enchantment. Ring of Bane of the Undead - The Bane of the Undead master restoration spell as an enchantment. Ring of Blizzard - The Blizzard master destruction spell as an enchantment. Ring of Call to Arms - The Call to Arms master illusion spell as an enchantment. Ring of Fire Storm - The Fire Storm master destruction spell as an enchantment. Ring of Flame Thrall - The Flame Thrall master conjuration spell as an enchantment. Ring of Frost Thrall - The Frost Thrall master conjuration spell as an enchantment. Ring of Guardian Circle - The Guardian Circle master restoration spell as an enchantment. Ring of Harmony - The Harmony master illusion spell as an enchantment. Ring of Hysteria - The Hysteria master illusion spell as an enchantment. Ring of Mass Paralysis - The Mass Paralysis master alteration spell as an enchantment. Ring of Mayhem - The Mayhem master illusion spell as an enchantment. Ring of Storm Thrall - The Storm Thrall master conjuration spell as an enchantment. Changed the Ring of Waterwalking to the Ring of Aquamancy and added Waterbreathing to it's enchantment. Added the ability to dis-enchant and re-enchant most of the custom (user created) enchantments in the Rings of Power main file. Rings of Potions moved to its own separate mod. Optional Rings are not included in the Rings of Power main file. Optional: Ring of Revival added- buffs only the health and stamina regen rate by 1000%. 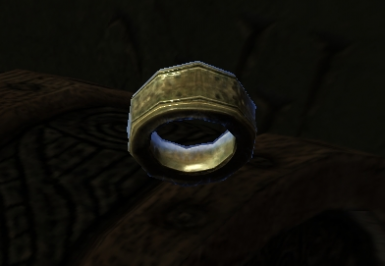 Based on Mtsaint's Unlimited Rings (http://www.skyrimnexus.com/downloads/file.php?id=1952) mod I was able to make the rings so they don't even take up a body slot, meaning you can wear all the rings if you wanted to.